Please continue Everwood series. It is not many shows that children and their parents can watch together. A wholesome family show. Our family enjoys this show. It brings families together at the same time. Many issues brought up in the storylines, parents can address with their children and communication lines are opened. Please reconsider the gold mine you created. If you are not going to bring back Everwood, please release all seasons on DVD. Thank you! bring back everwood. its the best. I Love Everwood since Las Palmas of Gran Canaria, Canaris Island. Jesse. 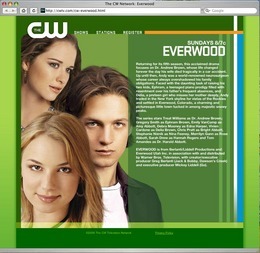 Please run repeats of Everwood on Channel 70 in Houston, Texas. and maybe awaken those lethargic mogals that want to cancel the show. This is so so typical. What the hell is wrong with all these TV Networks!! At least find some fast ending for these stories before cut it in the middle of no where. Hell with all these TV networks; NBC, CBS, ABC, WB, CW all the same bull sheet.